Recitals have begun. Sunday night was the first night - I carried three sleeping kids upstairs home from Grandma's house, grabbed leftover strawberries and a glass of white wine from the dining room, and tiptoed up to my tower studio where I painted (again! no pencil!). 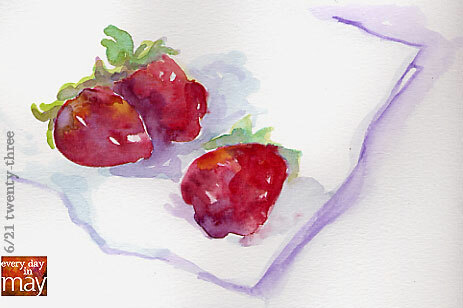 The heat from the lamp on the drafting table was making the strawberry smell even stronger, so I pretty soon the painting was finished (and so were the berries).